Affiliations: 1College of Nursing, 2College of Medicine, and 3Department of Anthropology, University of South Florida, Tampa, FL. 4Argonne National Laboratory, Chicago, IL. (r=.609, p=.007). We used multiple regression to assess the unique roles played by frequency of fever in the first year of life, age, and hemoglobin level on actinobacteria abundance. Frequency of fever in the first year of life and hemoglobin level showed moderate semi-partial correlations with the outcome: the frequency of fever in the first year of life semi-partial correlation was .426 and the hemoglobin level semi-partial correlation was -.547. The age of the child showed weak semi-partial correlation of -.059. Later introduction of solid foods was related to Tenericures (r=.804, p=.000). Conclusions: Firmicutes, Bacteroidetes, and Actinobacteria constitute the most abundant phyla in the human intestinal microbiota, with Firmicutes and Bacteroidetes being predominant in healthy adults and Actinobacteria in breast-fed infants. . The correlation between hemoglobin level and the gut microbiome suggests that certain species of gut bacteria could influence hematopoiesis and how the body processes oxygen. It is also possible that diet plays a role in this relationship. The gut microbiome is an important regulator of physiological and pathophysiological effects. Further research is necessary regarding children’s health and hemoglobin relationships with gut microbiome. Summary: Establishment and succession of the human microbiome begins at birth and microbial composition adapts alongside human development and growth. 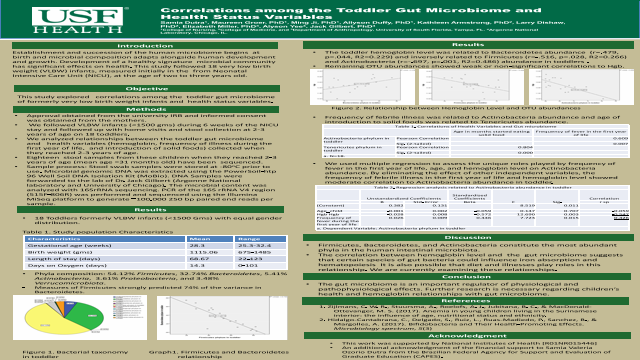 Development of a healthy signature microbial community has significant effects on health.This study followed 18 very low birth weight (VLBW) infants, measured initially in the from Neonatal Intensive Care Unit (NICU), at the age of two to three years old.References: Zijlmans, C. W. R., Stuursma, A., Roelofs, A. J., Jubitana, B. C., & MacDonald-Ottevanger, M. S. (2017). Anemia in young children living in the Surinamese interior: the influence of age, nutritional status and ethnicity.